Water Slides are awesome on hot California days and Nor Cal Party Rentals has a great selection of wet and wild fun for your next event. This giant inflatable water slide rentals are really big so check dimensions to make sure you have the space. 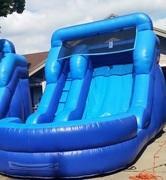 We do have water slide rentals for a variety space allotments. At Nor Cal we also have bounce & slide combos available for water use as well. Browse the selections below and click on the "More Info" link to get more details and to make a reservation.